When I was cycling from Delft in the direction of The Hague, a few months ago, I stumbled upon a cycle bridge in Rijswijk. The stylish white bridge drew my attention immediately and I decided to stop and film it. Back home I soon found out the bridge was opened in 2014 and designed by well-known design and engineering firm ipv in Delft. People cycling on “De Oversteek” a cycle bridge in Rijswijk. Rijswijk is a town in the highly urbanised region between The Hague and Delft. There are a number of barriers to cycling here. Several motorways and a lot of waterways. 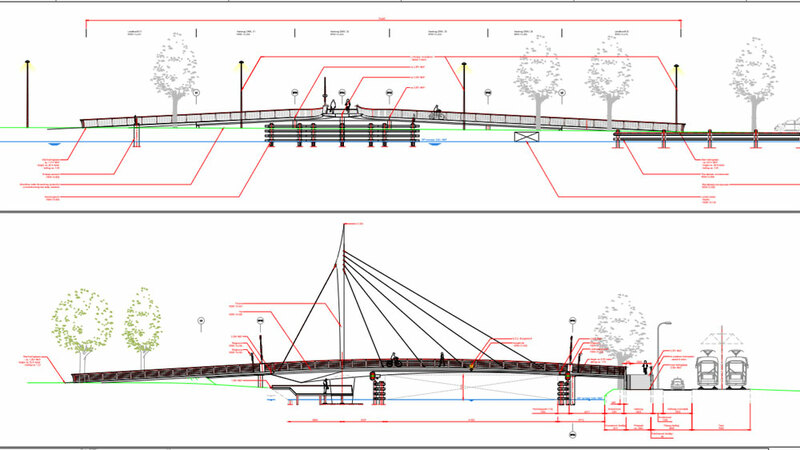 To take away one barrier in Rijswijk the city region had the wish to build a cycle bridge over the Rijn-Schiekanaal, locally also known as Delftsche Vliet. This bridge would connect residential and recreational areas and places where a lot of people work. On the day I filmed the sky looked like one painted by a 17th century Dutch master. The city region and the municipality chose a location roughly between two existing bridges. There was not so much space, a reason to carefully weigh all the options. A fixed bridge would have to have a bridge deck at 7 metres over the canal for the type of ships that can and do use this canal. Such a high deck would require considerable access ramps and there was no place for them here. That is why it needed to be a bridge that opens. The architects ipv in Delft found an innovative solution, as can be expected from this highly experienced firm. They designed a lot of interesting pieces of cycling architecture that I already showed you on my blog before. The Hovenring in Eindhoven. 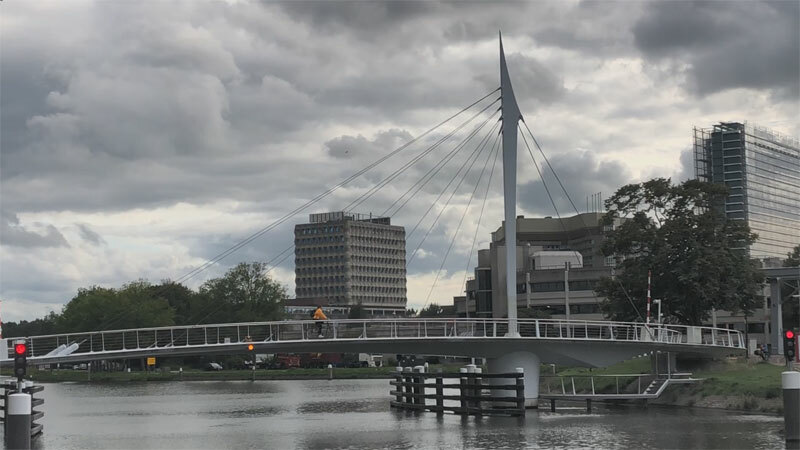 The submerged bridge in Haarlem, a cycle bridge in Enschede, one in Nigtevecht and they saved the day in ‘s-Hertogenbosch with the new Bartenbrug after the original design led to a fiasco. This smaller ship could easily pass under the bridge deck at 3 metres over the water. 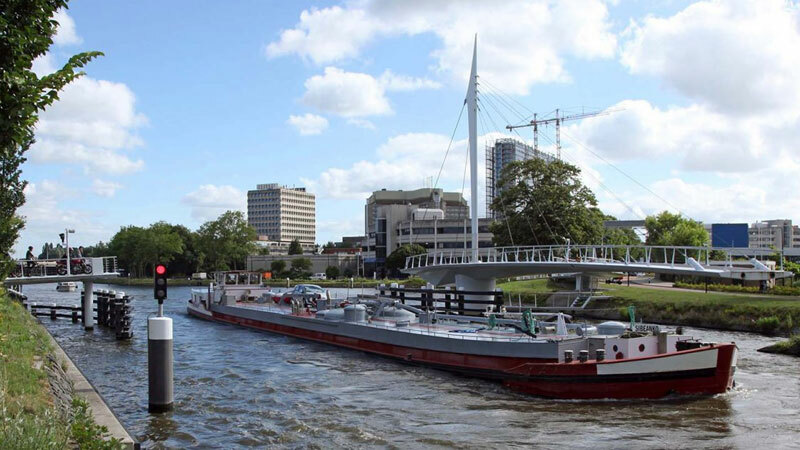 Ipv Delft designed a cable stayed steel bridge with a single pylon and concrete abutments. What is special is that the entire bridge can swing to one side to let larger ships pass. The stylish asymmetrical single pylon stands 18 metres tall. The moving deck is 35 metres long, while the total span over the river is 50 metres. The bridge deck varies in width from 3.5 metres to 4.3 metres. 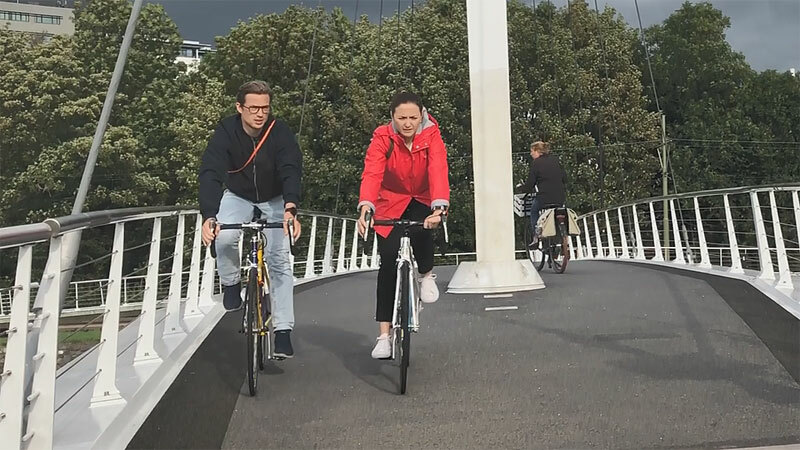 The deck is 3 metres over the water and shared between people walking and cycling. 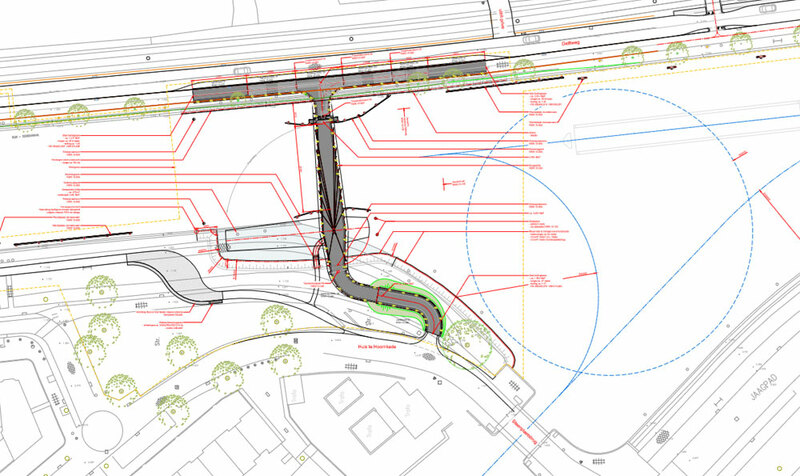 The drawings show a different coloured walking strip on either side with a cycleway in between in a slightly lighter colour grey. In reality I noticed people used the full width of the bridge and just swerved around any pedestrians. Mopeds are not allowed on the bridge. (Only the lighter type, the ones which are legally considered to be bicycles.) The bridge’s handrailing, with integrated LED lighting, is 101 centimetres tall. Thanks to the 12 cables the bridge deck can be very slender. It is only 18 to 40 centimetres high which means the bridge forms no visual barrier. A map of the bridge with measurements from the bridge’s drawings entered for the National Steel Prize. (Picture ipv Delft). From November 2013, the bridge was manufactured in Zwartsluis in Overijssel. That is 175 kilometres to the northeast. The bridge was literally shipped to this location and put in place with two giant cranes, in two days, in May 2014. People could use the bridge from July but the official opening took place on 31 October 2014. Sign with the name of the bridge that was chosen in a competition with over 700 entries. The name is not very original. De Oversteek simply means “The Crossing” of which we already had one in Nijmegen. The public was asked to come up with a name. This has proven to be a way to get predictable and common names. That is how we ended up with two “Snelbinders”, one in Nijmegen and one in Naaldwijk. 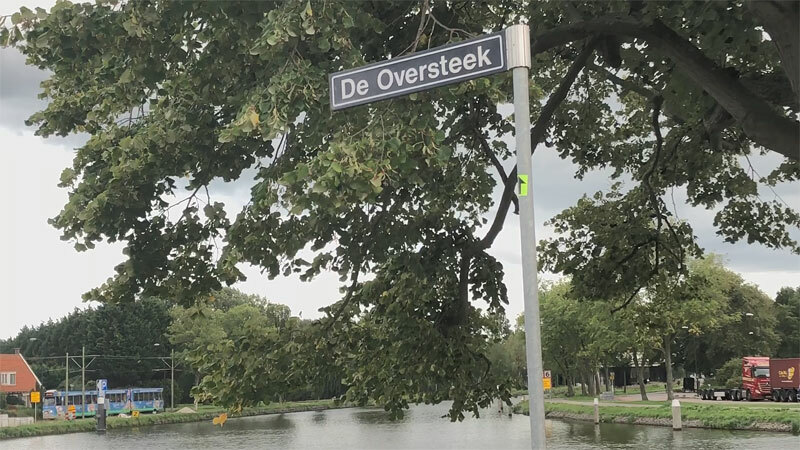 Here, over 700 people sent in their idea and a few dozen chose “De Oversteek” (the Crossing). Again, this is the name of an existing bridge in Nijmegen! The bridge cost 2.4 million euros according to the designer, but the entire project was 9 million euros. This amount was mostly paid by the regional authorities (90%), the municipality of Rijswijk paid the remaining 10%. The design was an entry for the National Steel Prize competition in 2012, but it didn’t become one of the nominees. That year the Garden Bridge of ʼs-Hertogenbosch won the prize. I published about that bridge earlier. Thanks to the entry for this competition the detailed drawings for this bridge can be found on the internet. My video of the bridge. A ride over the bridge in both directions. I think that the British come up with better names in this type of situation. The public chose the following name for a new Navy ship: Boaty McBoatface. Sadly, the Navy refused longer the contest results for the name of the full vessel, but they did name the safety dinghy on the boat by that name. This might be the first time I’ve reached a bit of interesting Dutch infrastructure before you Mark! Over two years ago one day when I was cycling to the ferry I took a detour via Delft from Den Haag, for fun. Naturally when I saw this bridge I had to go try it out! I assume that the bridge is unmanned and opens and closes automatically as necessary. That must require sensors to detect tall enough ships approaching. It would need to be smart enough to know when there are multiple ships and stay open longer. Pretty complicated with opportunities for mistakes. Not quite how it works in The Netherlands. We have many bridges to operate. So we have one location (per region) where a number of bridges are operated from. So indeed not manned but remotely operated by a human being. Cameras give the opportunity to see if the bridge is clear. There are even speakers installed so the operators can give people instructions. This usually gives enough safety. Although things do go wrong sometimes. For ships there are traffic lights on both sides of the bridge. 2 red lights above each other means: bridge is closed for ships. 1 red light means: bridge in operation, maybe you have to wait (sometimes for emergency vehicles) 1 green light means: continue, the bridge will open for you in time. If 2 or more ships approach the bridge from both directions it is up tp the controller of the bridge who has priority which he/she controlls with the lights. Very cool. Thanks for sharing this. Greetings from Kentucky. 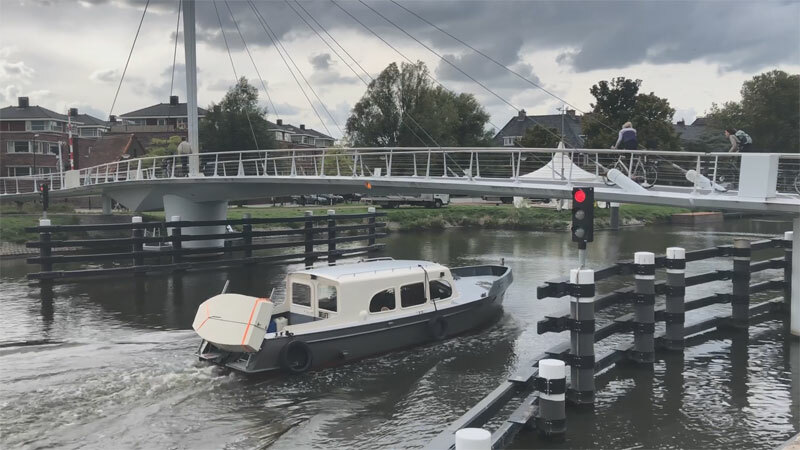 This entry was posted on 16 January 2019 by Bicycle Dutch in Original posts and tagged bridge, exceptional cycling infrastructure, Rijswijk.